Red Hot Sale for Cool Savings! All of us at Stuff4Beauty wish you a Happy 4th of July 2006! We are kicking off this long exciting weekend with some extra special sales to help keep you cool by letting you shop with us right in your own home! 3rd ANNUAL 4th of July Summer Sale! Starting Friday June 30, 2006 and ending Wed. July 5, 2006 we will have a “no coupon code needed” $4 off all orders over $85 and free shipping for all USA (48 state) orders! Then to top it off, we are adding loads of products in our Salon Products Clearance Close-Outs section. From time to time we receive shipments from our suppliers that will have some damage that happened during shipping. Some of these products are damaged so bad we do dispose of them. Some products are basically fine and may have light scuffs on the bottles or cans, or the caps broke, or a few dings or dents. We do not sell these products to the public on an everyday basis, we put these products aside for our annual 4th of July sale! This year we have 100’s of these products at extra special prices. We are offering a lot of them to you in 2 packs and some cases, 4 or 6 packs! This “no coupon needed special” is GOOD for these clearance products too! Give your hair “TIME OFF”! If you often heat style your hair using flat irons, curling irons or blow dryers, your hair may feel dry, brittle or damaged. Try giving your hair a break from this abuse and air-style it for awhile. Your hair will love you for it. This is easier than you think. All you need is the right tools and products for doing this and you will be so happy you tried it! Wash and deep condition for starters, then…………….. Grab a big fluffy (a very absorbent) towel, your favorite light leave in conditioner such as Back to Basics Sunflower Leave In Conditioner, and a few hair clips. Blot the excess water from your hair very gently. Do NOT rub!! Rubbing wet hair causes frizzies and split ends. Lightly spray a leave in conditioner on your hair and if needed apply mousse or gel (small amounts work fine). Then gently finger comb the hair and pull the hair on the sides back in two large clips to add volume while it is drying. Once it is dry, you will have natural waves and volume. Best of all, your hair will be shinier, and it will look healthier. Don’t be afraid to experiment with clips and you may find a great way to give your hair that badly needed break from heat styling. 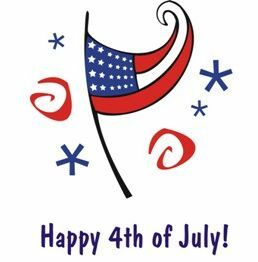 Have a safe 4th of July and don’t forget to keep checking and browse our Clearance section, because products will be being added continuously through-out the week and weekend!